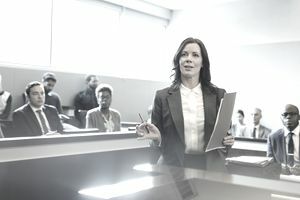 A lawyer who specializes in civil litigation is known as a “litigator” or a “trial lawyer.” He represents clients across a broad spectrum of associated proceedings, including pretrial hearings and depositions, as well as arbitration or mediation before administrative agencies or court personnel. Arbitration and mediation are processes that attempt to guide the parties toward settlement without the time and expense of going to court. Civil litigation can be loosely defined as a legal process in which criminal charges and penalties are not at issue. The role and responsibilities of a civil litigation attorney can be challenging and diverse. It is an adversarial process with two or more parties pitted against each other. The attorney is his client's advocate, obligated to fight for him to achieve the best possible outcome on the client's behalf. Lawyers specializing in this field must be willing to assume oppositional positions, to embrace conflict and controversy, and to effectively act as human pit bulls in defense of their clients. Attorneys and litigation paralegals in this field often work long hours, especially during a trial. Civil litigation can be divided into several stages, including investigation, pleadings, discovery, pretrial proceedings, potential settlement or trial, and even appeal. Discovery is typically the longest and most labor-intensive stage of a case. Unlike the way they're often portrayed on television, civil attorneys spend comparatively little time in the trial. Much of their time is devoted to the discovery stage -- the exchange of information pertinent to the case through depositions, interrogatories, and subpoenas. The latter are demands for information or documents from third parties. Depositions and interrogatories involve questions posed under penalty of perjury to the parties in a lawsuit. Deposition questions are posed orally under oath. Interrogatories are written questions. Not every lawsuit passes through each stage -- in fact, most don't. The majority of lawsuits are settled by agreement of the parties and never reach the courtroom. Parties can settle during a trial, even after a jury has begun deliberating or has delivered a verdict. They can settle or "stipulate" to some aspects of the lawsuit, leaving others in the hands of the judge or jury.